GWBlogspot.com: EDITED: How Does This Make Any Sense? This blog is a project of students in George Washington University's Internet & Politics class. 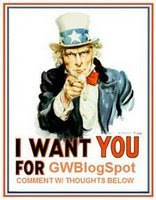 Follow GWBlogspot on Twitter. EDITED: How Does This Make Any Sense? "Unfortunately (class names) are all kids have to go off most of the time," Leighton said. David Grier, dean of academic programs in the Elliott School of International Affairs, called a class he is currently teaching "Obscure and difficult readings in international affairs" as a way to dissuade students from signing on. "To keep numbers down, I scheduled it at the end of the day on Friday and gave it an unappealing name," he wrote in an e-mail. "Even this didn't do much good. I have 11 students in it." Why would a teacher NOT want students to take their class?? And why would they want to lie to students about the class in the first place?? This got me pretty peeved, mainly because students should be able to be informed about a class on University Bulletin, and not just take it because of the title. CCAS recently just e-mailed me asking to take a survey on the GCR's in Columbian and if I get a wide range of options for taking classes I am interested in because they want to make a change. Well how is a student supposed to take a class they are interested in, if the only thing they are getting is the course title?? GW needs to step up it's game when it comes to giving descriptions of the classes in the University Bulletin if they are really are so called concerned about the student body taking classes they will enjoy. as an unpaid overload, a course beyond my standard load. free period that I had. Guess the Hatchet didn't get it right AGAIN. lol, that's awesome. I assume so he can do his independent research without having to deal with students. Xavier -- what say you? Click the orange icon to subscribe to our feed and get up-to-the-minute posts delivered straight to your RSS reader! Or, enter your email address below to get GWBlogspot updates via email! A Case for Armed UPD? seeds day on capitol hill! Finding a summer job at GW? Good luck. Is it Just Me, or is This WAY Too Scripted? PIKES fireman's challenge...IS THIS WEEKEND! Do You Like Coffee a...Latte? In praise of The Hatchet?! Yes. Bring on the soul-crushing desk jobs! "Aerobics Girl" from GWTV tells all!!! What about all us non econ majors? Study Abroad. More staff. More results? CCAS Advising – What a Crock! GWBLOGSPOT XCLUSIVE!!! CRANES ARE AWESOME!!! Housing, Admissions, this one’s for you!